Two years after the Wales Summit, the world changed drastically. European citizens need to be secured and the fact that they live in EU member states, NATO member states or states which are a member of both organisations (NATO and EU share 22 members), makes that a strong cooperation between NATO and EU more necessary than ever. NATO and the EU share strategic interests and the EU is without doubt a unique and essential partner for NATO. This strategic partnership has been defined in the 2002 NATO-EU Declaration on a European Security and Defence Policy. A year later, in 2003, the Berlin Plus arrangements provided the basis for NATO-EU cooperation in crisis management. Meanwhile NATO and EU cooperated or are still cooperating in the Western Balkan, Afghanistan, Sudan and on the coast of Somalia. The subjects discussed by NATO and EU expanded considerably over the past two years as the security environment changed rapidly. The crisis in Ukraine and the relations with Russia increased the contacts. 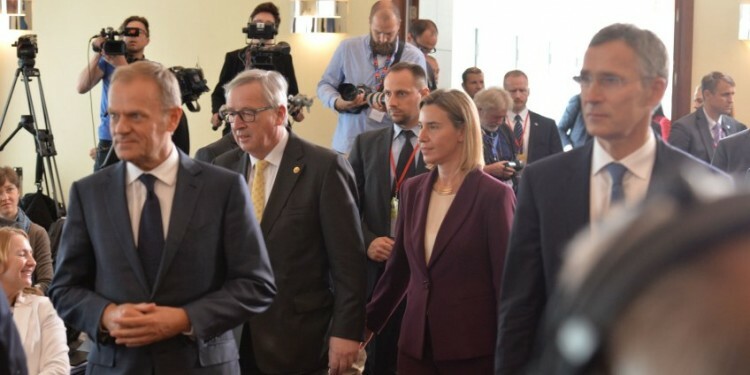 Therefore, one of the key issues discussed at the Warsaw Summit – which in the past months has been described as one of the most defining summits ever – was the NATO-EU joint declaration. Only ten days after the publication of the Global Strategy for the European Union’s Foreign and Security Policy (EUGS) the joint declaration should reinforce NATO-EU cooperation. At the presentation of the joint declaration the President of the European Council, Donald Tusk, declared that “we are bound by much more than only common threats”. “The founding principles of NATO and EU are the same” Tusk added. Jean-Claude Juncker, the President of the European Commission, stipulated “stronger EU means stronger NATO, stronger NATO means stronger EU” arguing that both benefit from a closer cooperation and a new level of ambition. Last but not least NATO Secretary General Jens Stoltenberg said that EU and NATO will be able to use the available resources more efficient by working together. The joint declaration is meant “to give new impetus and new substance to the NATO-EU strategic partnership” and promotes cooperation as a strategic priority. The joint declaration includes a broad range of issues: hybrid threats, operational cooperation including at sea, coordination on cyber security and defence, development of defence capabilities of EU member states and NATO Allies, facilitation of a stronger defence industry (R&D included), parallel and coordinated exercises and fostering resilience of partners in the East and South. With last remark of the joint declaration the burden of implementation on the EU side rests now on the shoulders of the EU High Representative Federica Mogherini. This makes her responsible for the implementation of both documents, the joint declaration and the EUGS. Knowing that she was not a signatory of the joint declaration and that the (her!) EUGS was not formally approved by the Council but that “the presentation was (only) welcomed” puts quite some challenges on her table. One could of course argue that the Heads of State and Governments participating in the meeting of the North Atlantic Council in Warsaw will stand firm behind their commitments. Being at the same time also the leaders that participated at the recent European Council that welcomed the EUGS, it should be no problem to put ‘all the wood behind one arrow’. Experiences from the Wales Summit and the December 2013 and June 2015 Council meetings on security and defence showed however that political leaders do not always speak the same language once they are back home and have troubles translating their (international) commitments to national interests. When the fox preaches, beware of the geese!